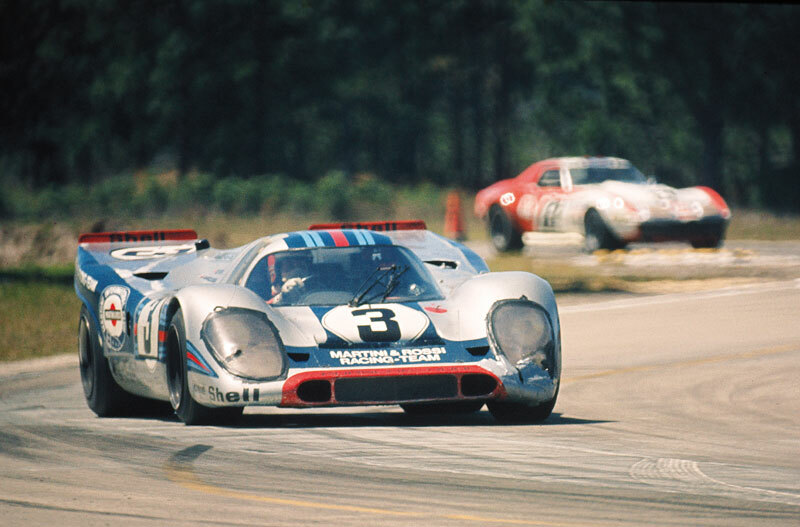 Vic Elford (the driver in the photo) and Gerard Larrousse won Sebring in 1971 driving this Martini & Rossi Porsche 917K. Their main competition came from the John Wyer Gulf Porsche 917 team and the Penske prepared Ferrari 512M driven by Mark Donohue and David Hobbs. During the race, Pedro Rodriguez's Gulf Porsche 917 had a coming together with the Mark Donohue Ferrari 512M. Donohue always felt that Rodriguez and the Porsche teams were trying to knock him out of the race. Some felt that the Penske Ferrari 512M had the best chance of beating Porsche 917s at both Daytona and Sebring but accidents at both races ruined their chances..